Amphitheater of Segobriga, at Saelices, Cuenca. Plan of Amphitheater of Segobriga. 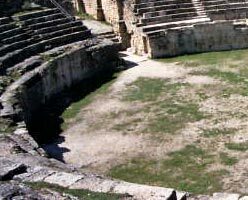 With a capacity for almost 6.000 spectators, Amphitheater of Segobriga is the best preserved on the inner Hispania. Doubtless, it is the greatest building from the city, but it seems smaller comparated with other peninsular theaters. It was built at the same age than the theater, at its opposite side, close to the main entry to the city. Constructive system was important for its place, since orography would let southern rows be directly supported on the ground. Northern one was built on a strong structure being 18 m. high. 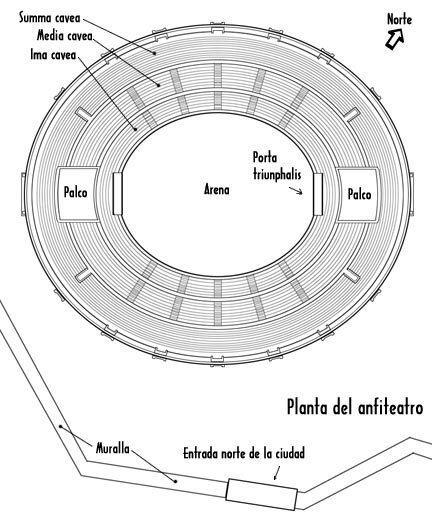 It has an elliptical plan: major axis is 75 m. long; minor 66 m. Longest distance on the arena is 40,5 m.
Arena was separated from rows by a podium. Inner part was endowed with carceres for beasts, rooms for gladiators and worship and a longitudinal corridor that joined them. Cavea was divided into three horizontal areas -ima, media and summa cavea-, separated by little walls for setting spectators depending on their social level. It was vertically divided into 12 cunei limited by stairs that end at vomitorium, doors for way in and out. 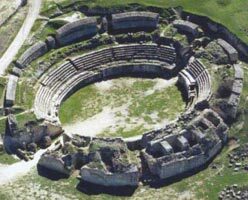 Amphitheater was used for its original function -spectacles- up to 3rd century. From 4th one it was used as an agrcultural store. At 17th century it was used as a quarry for building Ucles Monastery and so, it is partially spoilt. Remainings of the Porta Triunphalis. Aerial view of the Amphitheater.